Start your Mexican fiesta with super-fresh seafood tostadas. To make tostadas, cut each tortilla into four 6cm rounds, deep-fry in 180C oil until crisp (about 1 minute per side) and drain on paper towel. Marinate the calamari in lime juice, olive oil and salt for 15 minutes, strain and refrigerate. To make the salsa, preheat oven to 220C. In a 20cm x 30cm baking tray, place 60ml water with the tomato, roast for about 30 minutes until the top of the tomato is dark and charred. Allow to cool, strain liquid into a bowl and set aside, also reserving the pulp. On a barbecue over high heat, grill the eschalot, garlic and habanero until blackened and charred (10-15 minutes). Remove from heat and allow to cool. Place eschalot, garlic and half the habanero in a food processor and pulse lightly. Add tomato pulp in batches and pulse until chunky; add reserved tomato juice until desired consistency is achieved. Taste, season with salt, add extra finely chopped habanero if needed. 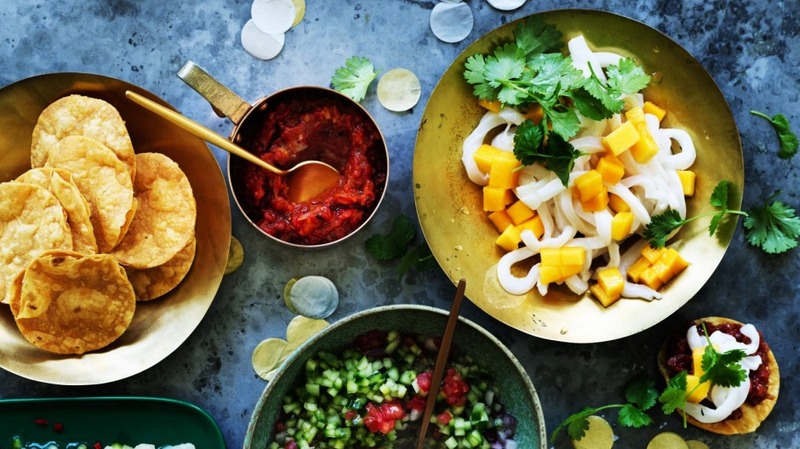 Place calamari on tostada, garnish with salsa chiltomate, red onion, mango and coriander. Pair with Neil Perry's kingfish tostadas and serve as part of his Mexican banquet (recipes here).